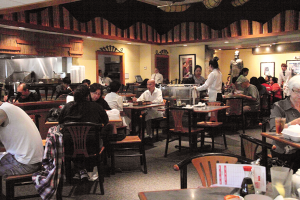 The dim sum tradition, ancient in China, is almost absent in San Antonio. True, potstickers seem to have propagated throughout Asian restaurants of every stripe, and spring rolls are everywhere you turn. But the full, clangorous service with steaming carts bustling their way through dining rooms crowded with extended families? One place only: Golden Wok. It’s a cultural experience not to be missed. Not that it isn’t a culinary experience, for dim sum is surely that. But even the literal translation, “touch the heart,” is inadequate; dim sum at its best is full-body: It involves all the senses with more than a little mental activity thrown in for good measure. This requires some explaining. And it requires some pre-planning. Good company, family or friends or both, is essential to the experience — not to mention the ability to order more dishes than might ever seem rational. On weekends, when dim sum are served from carts from 10:30 or 11 to about 2, endeavor to send someone ahead to get a name on a list. (Twenty minutes was the word when I arrived just before noon; it actually took only 15.) When seated, quickly peruse the visual list on the back of the menu—then be prepared to abandon it and just let dim sum happen to you. Oh, and one other thing: Dim sum is intimately linked to yum cha, or tea tasting, so be sure to take a look at the bottom of the menu where teas are listed. We selected a pot of the earthy yet incisive sow mee and were not disappointed. It’s potluck, as it were, which cart will arrive first, and with the possible exception of those selections that might be considered dessert, order is unimportant. Lidded bamboo baskets bearing steamed creations were our introduction: popular and puffy char siu bau stuffed with roast pork; precious and pinched sui mai stuffed with finely ground pork and shrimp; a kind of pig-in-a-blanket encased in banded, Michelin Man dough … it will soon become apparent that the menu is merely a suggestion of what might emerge from the kitchen. Don’t panic; just methodically decide what dish requires soy or chili oil — or no anointment at all — and concentrate on enjoying the process. 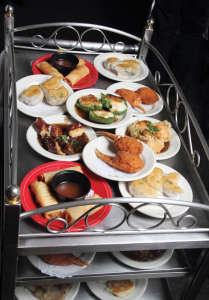 The universally delightful cart-pushers will be happy to aid and abet by explaining dishes that look forbidding — especially if you appear to be having a good time. Worried about what’s encased in that elaborately tied packet of lotus leaves? Don’t; it’s a perfumed rice with chicken, pork and shrimp, and it’s wonderful. Think you’ve had too many dishes with the same ground shrimp filling? Think again. The steamed sui mai is quite different in texture and, yes, philosophy, from the Medusa-like fried shrimp ball coiffed with shredded wonton skins. You aren’t obliged to have the steamed chicken feet in black bean sauce (none actually made it to our table on this day—though I have had them before), but if you do, the comforting barbecue pork will more than compensate. Should they appear, try the delicately braised (and only marginally chewy) squid fragrant with ginger; they’re a beautiful counterpoint to the lusty “radish,” or taro root, cake, spiked with bits of pork — if I remember correctly. Many things tend to blur. A couple of things, however, are abundantly clear. First, the price: For all of this — and three of us spent about an hour and a half, weren’t shy about sampling and had tea — the bill before tip was around $45. Sure, breakfast tacos are cheaper, but where’s the challenge in that? Second, the experience ended on a definite up note with the arrival of two dessert-like plates. “I’m sorry, but there’s only one of me,” offered the dessert cart server cheerily upon being asked about the availability of the lotus seed paste balls coated in crisp sesame seed — and then she detoured past the kitchen to pick up a plate of them fresh from the fryer. That they happened to be filled with red bean paste instead (and another paste which might have been lotus for all we knew) was hardly an issue; the point was the play of the still-warm and crackling exterior against the smooth, comparatively cool and barely sweet interior. Even more revealing was the egg custard presented in a cup of flaky pastry. The color of the custard was that of yolk intensified, and the flavor was of egg raised to a power of 10 — truly an astonishing finale and a reminder of just how good Chinese food can be when it’s playing on tradition, not being served from a buffet table.